Ultimate Moroccan Argan oil® Mint Shampoo is a unique fusion of moroccan argan oil and fresh mint essence which helps to deep clean scalp and hair leaving it soft, invigorated and refreshed. 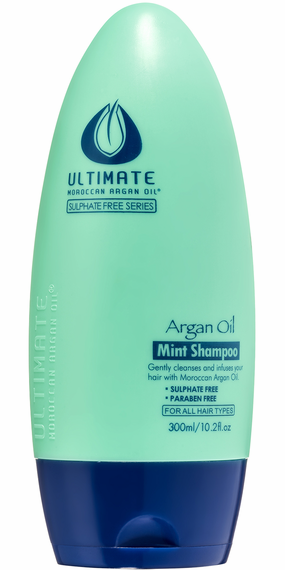 Ultimate Moroccan Argan Oil® Mint Shampoo has a calming effect on the hair strands, making them soft and manageable. The dreamy, relaxing fragrance of the fresh mint shampoo will leave your hair with an amazing and energizing scent. Apply to wet hair and gently massage into hair and scalp. Thoroughly rinse. For best result use daily and follow with Ultimate Moroccan Argan Oil Mint Conditioner.